From 1974 to 1985 I was involved in a collective of people who produced a monthly community newspaper in Hackney, the Hackney People’s Press. At the time, it was the most important thing in my life, and I devoted an inordinate amount of time to it. One whole weekend every month was devoted to its layout – typing the text on an IBM golfball typewriter, rubbing down headlines in Letraset, pasting the whole thing up on large sheets of white card. These were delivered to the printers on a Tuesday, and we would then collect finished papers from them on the Friday. The following Saturday would involve driving round various Hackney newsagents, leaving a few copies on sale or return, and collecting the meagre income from the previous month. The next morning, Sunday, a group of three or four of us would meet up on either the De Beauvoir or Holly Street estates, and sell some more copies door to door. The Centerprise bookshop was far and away the best outlet – some months we would sell 150 or so copies there. Altogether, we might sell a few hundred of each print run, so the paper never broke even. We were just about kept alive by a few ads, the occasional donation and the unpaid toil of a small but dedicated group of people. Although we were nominally a collective, rotating duties every month, I had the most print production expertise, and so I took on for myself a lot of the design and production decisions. When I first got involved, Crispin Aubrey was the mainstay of the group and he did all the business of liaising with printers and paying the bills. In those days, the paper consisted of a series of backed up A3 sheets, held together with three staples on the left hand edge. The sheets had to be collated and stitched by the collective, which meant another production session after the printing had happened and before we even got onto the streets. Crispin stood down sometime in the summer of 1975. After a few months, I got together with two or three other people (Hi Andy and Marilyn, wherever you are these days!) and we decided to make an attempt to bring the paper out on our own, using it to look for more people to join us. We decided to give up on the A3 size and produce the paper in A4 format. Although we still had to collate and fold the sheets this was easier than the stapling method. I designed a masthead and made the other design decisions such as what Letraset typefaces to buy. We continued in this way for a couple of years, and then I found out about a new firm of printers in Morning Lane. It was Turkish-owned and had some sort of tie to a Turkish left group – exactly who, I never found out. But for much the same price as we were producing a 16ppA4 publication, which we had to fold ourselves, we could get an 8pp A3 newspaper, all folded and finished. It was, as people say nowadays, a no-brainer. I designed another masthead, and invested in sheets of Letraset Futura Extra Bold Condensed, which I reckoned was a more authentic font for the headlines of a tabloid size newspaper. The final change to our production methods came when we moved over to cold-set web press production, and were able to use a red spot colour on the front and back pages. We first went to the SWP’s printer, Feb Edge, just off Hackney Road. A year or two later, the Militant’s printer nearby in Cambridge Heath Road approached us and offered us an even cheaper price, which we were happy to accept. (No room for comradely inhibitions about poaching clients between these two species of Trots.) Both outfits were pretty paranoid about their security. Their presses had impressive grilles on their windows and you never got closer than a locked front office when delivering artwork or picking up the printed copies. Quite why the paper stopped in 1985, I’m not sure. We produced an issue in June of that year, but then nothing afterwards. Normally I would have phoned the key members to arrange a meeting to plan the next issue, but for some reason I didn’t. And… no one seemed to notice. A year or two after this, I broke up with the girlfriend I had been living with through all this period. I took a big pile of back copies when I moved out of our house to the other side of Stoke Newington. Ten years later, married and with two small children, I dumped many of the duplicates into the recycling bin just before we moved to Ireland. And tidying up again, over the years since, I have now pruned my collection down to just one copy of each issue. 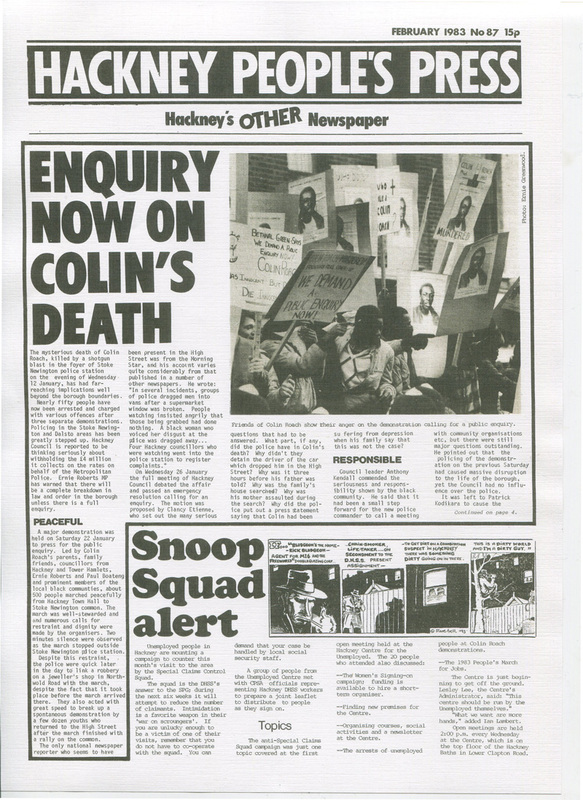 Back in 2013, I was able to donate an almost complete set of papers to John from the excellent Radical History of Hackney website, and I did an email interview with him, which you can see here. People occasionally still get in touch with me to ask the odd question about the paper, and I am happy to help. Crispin Aubrey, mentioned above, died suddenly in 2012 at the age of 66. I hadn’t seen him for years, but even then it was a terrible shock. He had been a real mentor to me in my early HPP days, and I used to look up to him with real admiration. His family have set up a fund in his name which helps journalism students at the University of the West of England. Further details here.